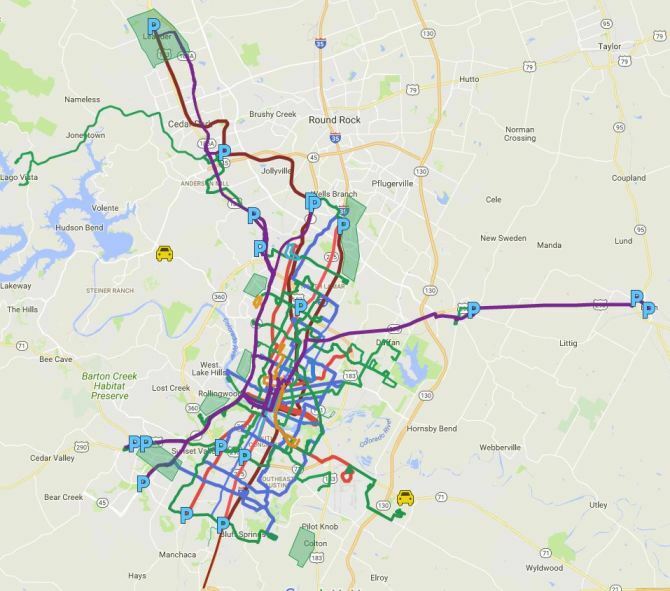 Capital Metro’s proposed Connections 2025 map. Graphic: CMTA. Capital Metro says it has a major renovation in its bus network underway. Perhaps, but in my opinion, Cap Metro is trying to do too much on too little money. In addition, the agency is politically manipulated, held on a tight city leash by long tradition, with top-down political forces in charge. Being a big institutional cookie jar has become a practical barrier to developing really smart, compassionate policy, one that riders can depend on from year to year. For example, good Cap Metro planners should understand and hedge against the fact that Cap Metro sales tax revenues can fall as well as rise, depending on the quirky volatility of Austin’s tech-based economy. This latest transit policy is the result of being forced to choose between two groups and types of service: trying to accommodate the scattered captive riders on the cheaper living-cost fringes, versus the more time-sensitive discretionary riders near the core. One of the kinder, more compassionate resolutions of this dilemma would be a compromise. The most needy or most bus dependent nearby areas would have bus service that at least wouldn’t get any worse for the next five years, come hell or high water. That way it would be possible for these folks to often hold service jobs in Austin, and the transit service could motivate people who struggle to meet tight family budgets to migrate to these same transit-friendlier areas. At the same time, in the spirit of compromise, Cap Metro could offer a few less 15-minute bus routes serving the core area, but this promise of improved, higher-frequency core service would be equally firm. But here’s another problem with that. Cap Metro suffers from an acute lack of transit planning that can stay on track for a time that exceeds the current management’s longevity and influence. Overall, the core problem facing Austin transportation is getting from cheap suburban living to living-wage jobs via existing highways like I-35. Roads like this will never be able to affordably handle this level of peak mobility demand. We should learn to regard congestion as self-limiting in nature. Insofar as this daily peak traffic is partly related to core retail commerce, will these jobs still be there in predicted numbers, after another five years of Amazon killing local retail? How did the planners at Cap Metro get in such trouble with their sales tax projections? Has that budgetary over-optimism been fixed? In my opinion, focusing on short-term planning and compassionate meeting of current transit needs in the next few years should get top priority. Included in this category is a $400 million light rail starter line segment down the Lamar-Guadalupe corridor, which is clearly needed today to unclog that corridor. Richard divided the service area into 10 square mile cells, added a transit center to each, added 8-16 passenger vans which by route or by demand pick up and deliver riders to destinations within their cell or to their transit center where demand based rapid bus service whisks them to another transit center and then by van to their destination. CMT is sustainable, quickly implementable, affordable within the current sales tax and grants, will increase ridership 2x, actually reduce congestion (while any rail solution does the opposite) and cut trip times in half. It’s time we the people insist that our tax $ be spent on true solutions like CMT.